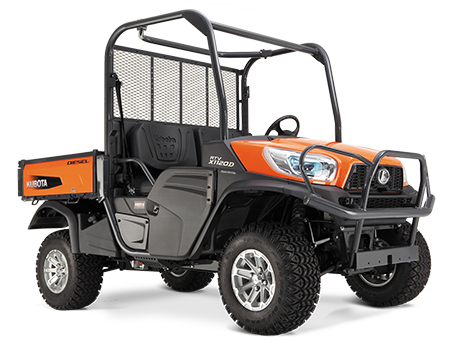 Experience outstanding power, comfort, convenience and style with Kubota’s RTV-X1120DW. Powered by Kubota’s rugged 24.8HP, 3-cylinder diesel engine, exclusive Variable Hydro Transmission (VHT-X) and alloy wheels. Body available in Kubota’s signature orange or camo. 24.8HP Kubota diesel engine provides a top speed of 46.4 km/h and plenty of hill climbing power. Advanced VHT-X offers a wide torque band and large oil coolers that boost performance and durability. 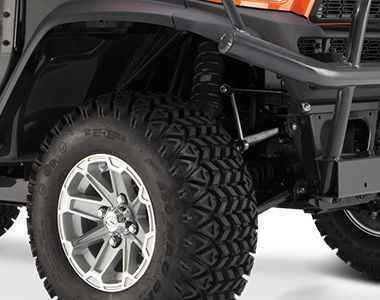 CV joint protectors and heavy-duty skid plates protect the most critical parts of the engine and transmission. Regardless of the terrain or load, independent suspension on all four wheels ensures a truly exceptional ride. Kubota’s Extra Duty IRS (Independent Rear Suspension) technology sets a new standard in durability. You’ll travel in style with stylish, machine-polished alloy wheels. Clear Coated to keep them bright and shiny. Realtree AP camo model features black alloy wheels with polished outer surfaces. With the RTV-X1120D’s increased speed comes increased dynamic loads; so you and your passenger are strapped in with three-point seatbelts. Bright and far-reaching halogen headlights with adjustable optical axis provide plenty of light for driving in dim conditions. Sculpted and tinted blue, these stylish lights add to the RTV-X1120D’s distinctive styling. True 4-wheel drive with a limited-slip front differential and a locking rear differential reduces wheel spin to a minimum, giving you greater control and a smoother ride on rough or muddy terrain. Ergonomically designed split bench seats provide hours of riding comfort. The driver’s side is adjustable fore and aft. Half doors on the driver and passenger sides help keep out the dirt, brush, and other external objects, while letting you enter and exit with ease.